The current RAAF Ensign is a "light blue Australian ensign" with the southern cross tilted and the RAAF roundel featuring a leaping kangaroo in the lower fly. 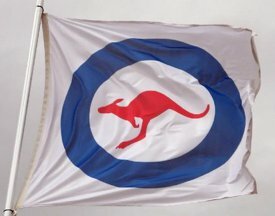 In 1981 the RAF roundel on the RAAF Ensign was changed into the red kangaroo roundel. The new design was approved by HM the Queen in 1981 and [proclaimed under] the Flags Act on 6 May 1982. Because the Southern Cross on this ensign is tilted clockwise, the individual stars appear to have one point down and two points up. "the Southern Cross as a whole is angled away from the fly with the "Gamma Crucis" positioned as for the Australian National Flag and "Alpha Crucis" positioned 1/6 of the width of the fly from the middle line of the fly and 1/6 of the width of the fly from the bottom edge." According to my geometry, this results in an angle of rotation of approximately 14.036 degrees from the vertical. The 1982 Proclamation by the Governor-General, Sir Zelman Cowen, is scanned into the RAAF website as a single page. The Schedule describes the modified Crux & roundel in a single, wordy paragraph that is basically unreadable. However it is correct. Its 2008 re-proclamation on Comlaw (F2008L00202) is accompanied by an Explanatory Statement that includes the wordy paragraph mentioned above, with several words of the first sentence altered to refer back to the 1982 original. However later in the paragraph two separate lots of text, amounting to about two lines worth, have been omitted. The missing text is part of the description of the RAAF roundel dimensions. The 'Flags of Australia' chart [vau83] said that the new RAAF ensign was approved by King George VI in December 1948 to replace the RAF Ensign in use in Australia since 1922. Similar information can be found in the Ausflag website. The most authoritative source is on the Australian Bureau of Statistics site, an article contributed by the former Department of the Special Minister of State. It says that the southern cross and commonwealth star were added "in the same positions as on the Australian Blue Ensign". The result is a "light blue Australian ensign" with the cross tilted and the RAF roundel added in the lower fly. The flag was actually adopted by the RAAF in 1949. Although the current version is a Section 5 Flag of Australia, proclaimed in 1982 (& again in 2008), it's predecessor was not. The 1948 RAAF Ensign was approved by the King, but the flag does not appear to have been gazetted in Australia, nor is there an actual introduction date. It seems to have been purely an item of military regalia. In the flag exhibition at the York International Congress of Vexillology there were also two Australian Air Force Ensigns on display (Collection C. Moss). One was the current version from 1982. The other one was very interesting, insofar as it had a reverse different from the obverse. The obverse showed the old pattern (1948-82) with the "British" roundel, the reverse the new pattern (1982-) with the kangaroo roundel. Does anyone know when or if this version was used? The other surprise is that the seven-pointed stars on the Royal Australian Air Force Ensign are very irregular. Also the shades of blue and red aren't the same as the White Ensign and the white is actually a bluey grey. The written description of the Ensign is also less detailed than that in the original proclamation. Seen in a pub in Bali, this RAAF ensign hanging on the wall. It looked to be maybe 18 x 36 inches. The flag resembles the old 1948-82 Royal Australian Air Force flag/ensign, except the (British) Royal Air Force roundel has replaced the federation star. From National Archives (PRO) AIR 2/211, on 24 July 1922: "Royal Air Force Ensign approved without difference as the Ensign of the Royal Australian Air Force." Until 1948, the RAF ensign was used. The NAA file can be accessed online from http://recordsearch.naa.gov.au/SearchNRetrieve/Interface/DetailsReports/ItemDetail.aspx?Barcode=7649240, and is an attachment to Air Board Agenda No 106, with date given as > 1 July 1921. The article on the ensign at the RAAF website says "With the formation of the Royal Australian Air Force on 31 March 1921, as the successor to the Australian Flying Corps which had been established by the Australian Army in 1913, it was decided to have an Ensign which could reflect the national identity of our military aircraft and would include a distinctive roundel. However, while a specific RAAF Ensign was formally approved by Air Board and the then Minister for Defence on 10 August 1921, it was not processed for Royal approval. Consequently, the RAF Ensign was adopted without change by the RAAF and was flown until 1948." The 1922 RAAF Air Council is illustrated in Elizabeth Kwan's "Flag and Nation" at page 83 [kwa06]. I drew the illustrations for Elizabeth's book, including this flag. According to The Australian Experience of Air Power (p.36, published by the Air Power Development Centre, 2013, PDF available at http://airpower.airforce.gov.au/Publications/Details/535/The-Australian-Experience-of-Air-Power---2nd-Edition.aspx#.VBl19BbIToo), the ensign proposal was submitted by the first Chief of Air Staff, Richard Williams, on 21 July 1921. The same source also mentions that the service was still the Australian Air Force at the time, with the "Royal" being added on 13 August 1921. However, the proposal is explicitly for the Royal Australian Air Force. Apparently, this proposal was in anticipation of the name change. The RAAF Manual of Ceremonial, AAP 5135.002, which is downloadable at this Air Cadet Corps site, gives details on the use of flags in the RAAF. The Australian national flag is flown at all times on RAAF establishments on its own pole at wing or group headquarters; it is never flown on an RAAF flag mast (i.e., a nautical-style mast with gaff and crosstree). The RAAF ensign is flown from the gaff of the flag mast until sunset, or after sunset as well if flyng operations are still in progress, the ensign is spotlighted, and the lights do not interfere with operations. Within Australia, the Australian national flag may be carried with the RAAF ensign if RAAF troops are parading with foreign troops who are carrying their own national flag. Outside Australia, RAAF troops parade with an RAAF ensign flanked by two Australian national flags. On these occasions, the national flag and RAAF ensign are mounted on staffs 2.6 m long tipped with 15 cm silver-colored spearheads. "Under no circumstances are Colours overseas to be paraded or placed with the Australian National Flag or the RAAF Ensign." At courts martial, the RAAF ensign and Australian national flag are both displayed in synthetic silk "suitably fringed and tasselled" mounted on crossed pikes. Same display in offices of senior officers. Folded lengthwise, lower edge being folded over to meet the upper. Then the fly is brought up to meet the hoist. The flag is folded lengthwise again. The flag is folded lengthwise again, leaving nothing visible but the Union portion of the flag. However, the section of the manual on funerals provides for US-style folding of the flag into a triangle at such occasions. This applies to either the Australian national flag or the RAAF ensign used to cover the casket. Fifty Australian air ensigns of the Volunteer Air Observers Corps, an air force auxiliary corps, were ordered on 10 July 1945. Perhaps they were never issued as the Corps was reduced to a cadre in December 1945 and disbanded on 10 April 1946. The VAOC flag was a modified 72 by 36 inches Royal Air Force Ensign with a yellow eagle superimposed on the roundel and V A O C in white below the Union. The eagle's wingtips touched the roundel outer edge. The VAOC letters were each 1.25 inches 'thick' and 5.5 inches high, with their upper edges nine inches below the Union bottom edge. The roundel is smaller than usual. It would have been 15.63 inches outer diameter and centred about one-third of the fly width up from the flag's bottom edge. Drawings of this flag include the note 'Normal Roundel' near the reduced-size RAF roundel. This suggests that the size and position of the roundel on Australian RAF Ensigns was changed, perhaps as a wartime 'austerity' measure to save bunting. Until 1942, standard RAF markings were used by the RAAF. In order to avoid confusion with Japanese planes, the red was removed from the roundel and fin flash. See photo at http://www.raafmuseum.com.au/raaf2/assets/images/e30.jpg. This roundel and fin flash were in use from June 1942 until 1946. Regulations of 26 September 1956 replaced the red dot with red kangaroo, but only in 1982 was it also changed on the RAAF ensign. Naval air arm and miltary aviation use the same marking. This page http://rides.webshots.com/photo/2792039430059648701SQsTYi has it captioned as "Flag of the RAAF - Royal Australian Airforce". We have seen mention of this flag previously and if I recall, its status remains unclear. The Royal Australian Air Force (RAAF) continue to use their traditional ensign (Australian flag with light blue field plus roundel). Whilst I do not know the status of this roundel-flag, I suspect that it is used in circumstances where there is an RAAF presence, but it is not appropriate to use the RAAF ensign. The most logical example of such an occasion would be at an Air Show or Trade Exhibition - and the roundel-flag has been created to act in a manner equivalent to a company flag or similar flags made from corporate logos. The RAAF is very protective of the copyright use of its emblems, so I suspect that it does have some official authorisation by the RAAF. Accordingly, I think we should regard this as an unofficial banner of the RAAF for use where a "brand identity" is required, rather than the official ensign.